Nguyễn Ðức Thọ was born in Hà Nam Province in the north of Vietnam on 20 September 1945. Due to the persistent threat from French forces, Thọ and his family moved twice during his childhood. From his native Hà Nam Province, Thọ first moved to Thanh Hóa Province, a central region below Hanoi in Military Zone 4. Here, his mother sold fabric at the local market and donated bundles to Việt Minh forces in preparation for the battle at Điện Biên Phủ. His family also donated three bicycles to the Việt Minh, important and valuable commodities for the army as a basic means of transporting goods and equipment. In 1952, Thọ and his family moved to Hanoi. As Thọ displayed an interest in drawing as a young boy, his parents allowed him to take extra-curricular classes with other artists in the city including Mạnh Quỳnh, Đinh Minh and Phạm Viết Song. From 1961 until 1962, Thọ studied the intermediary course at the Vietnam Fine Arts College in Hanoi, which he graduated from with good grades. An important stepping-stone in reaching the Vietnam Fine Arts College diploma course, Thọ took great benefit in studying alongside other future artists including Lê Quang Luân, Giang Nguyên Thái, Đỗ Hiểu, Lư Như Hà and Đỗ Văn Kế. His classmates would also become members of the Vietnam Fine Arts Associations in Hanoi and Ho Chi Minh City. On 31 May 1965, during America’s heightened bombing campaign of the Second Indochina War, Thọ joined the People’s Army of Vietnam (PAVN) and served as a scout for the 122mm cannon artillery regiment at the age of twenty. 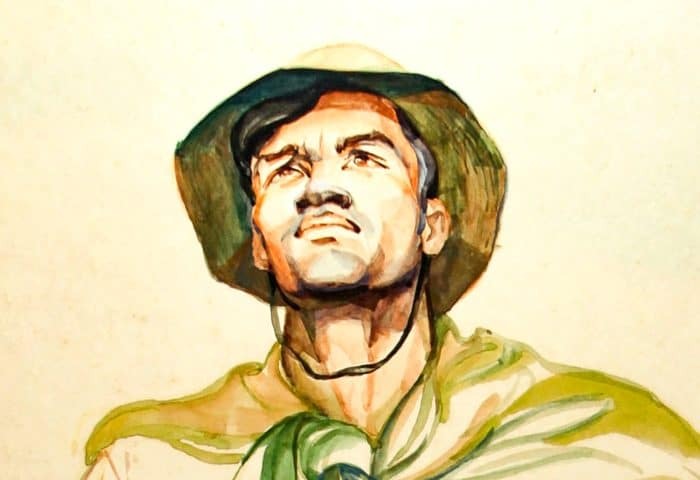 After being recognised for his artistic talent in 1965 from his illustrations for the “wall newspaper” (bích báo) he was working for, he was transferred to 368 Artillery Brigade’s propaganda department where he made decorations and slogans on banners until 1966. For the majority of 1967, Thọ was sent to the Soviet Union for artillery training and education along with half of 368 Artillery Brigade. He studied how to plot flight paths and anti-aircraft missile training, as well as continuing to make propaganda artwork for the resistance forces in Vietnam. On his return to Vietnam at the end of 1967, Thọ was assigned to the Hanoi Air Defence Division 361 until 1969. Thọ claims that his unit was the first anti-aircraft artillery unit to shoot down a B-52 bomber over Hanoi. In 1970, he was transferred to the Political and Propaganda Department of the Hanoi Air Defence Division 361 as a propaganda training officer. 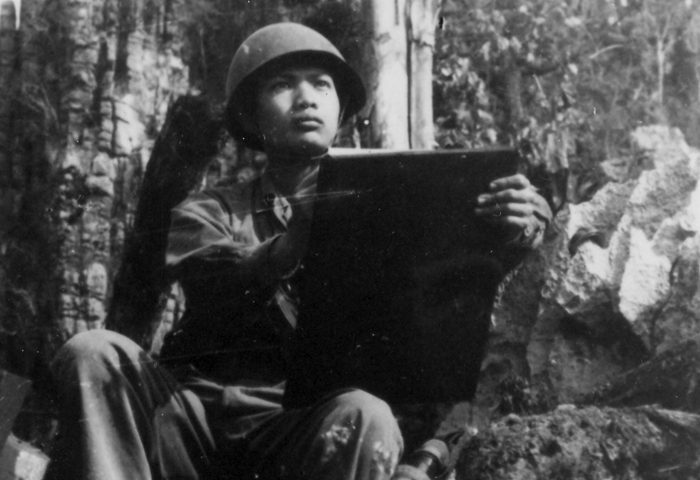 Thọ was in charge of making banners, decorating meeting halls and drawing propaganda posters for his unit. His unit had its own newspaper but, since it did not have a printing press, it required the skills of soldiers who came from art school for their fine hand-writing and ability to create “beautiful captions”. 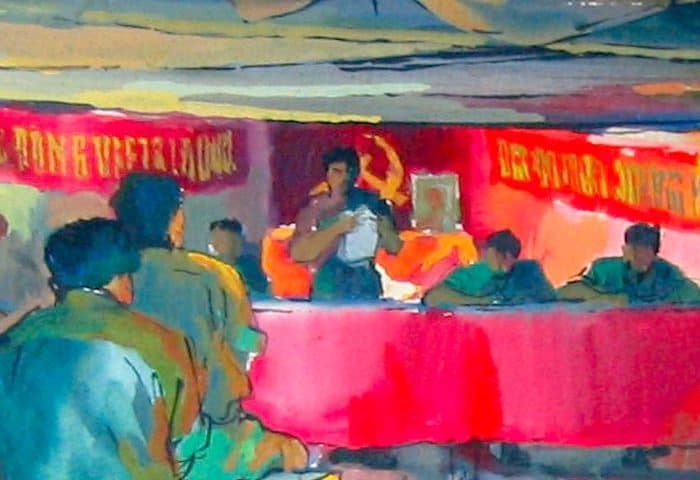 Thọ was also responsible for teaching fresh graduates from the Vietnam Fine Arts College intermediate and diploma courses how to make propaganda art. 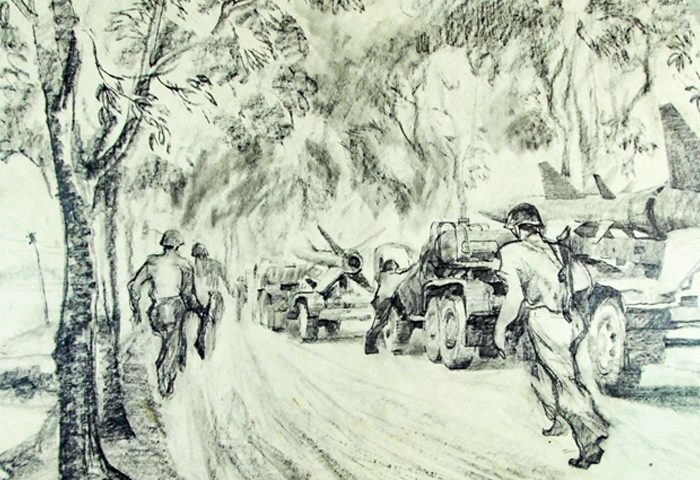 He explained the pragmatic manner in which he evolved into becoming an army artist, something he had not expected, but which was driven by what he described as the PAVN’s natural demand for art. He remained in this role until 1983. In the period between 1970 and 1975, Thọ made various excursions along Trường Sơn Road (better known as the Ho Chi Minh Trail) to artillery units based in Hải Phòng, Hạ Long, Quảng Trị Province, and Khan Muon and Savannakhet Province in Laos, paid as a soldier-artist to document the events there. Primarily, Thọ painted watercolour portraits for propaganda purposes. Despite being able to choose his own subjects, he had to find good soldiers who were well respected with numerous awards and portray them as idols for other units and divisions. These were considered the most important subjects for propaganda images. It was during this time that he also made studies for his own future studio work. Where possible Thọ travelled to different locations by car but often had to travel on foot. On each expedition, Thọ was assigned a reliable and skilled soldier to protect him, as he did not carry weapons of his own. These bodyguards were invaluable in negotiating areas renowned for landmines and unexploded cluster bombs. 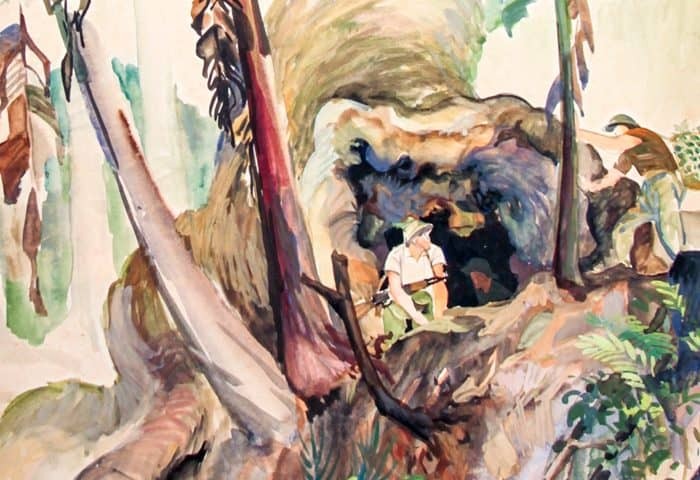 Thọ was sponsored by the Vietnam Fine Arts Association and the General Department of Politics for these expeditions, which provided him with watercolours, oils and paper – even though he commented that the paper was sub-standard. While living with various units, he would organise and contribute to art exhibitions held in divisional barracks to show his portraits. His works were also published in the People’s Army Newspaper (Quân Đội Nhân Dân). As if not busy enough, from 1971 to 1975 Thọ enrolled in and graduated with a diploma from the Vietnam Fine Arts College. Due to the flexibility of his college course, the army allowed him to continue with the course three to four months of the year during the war. 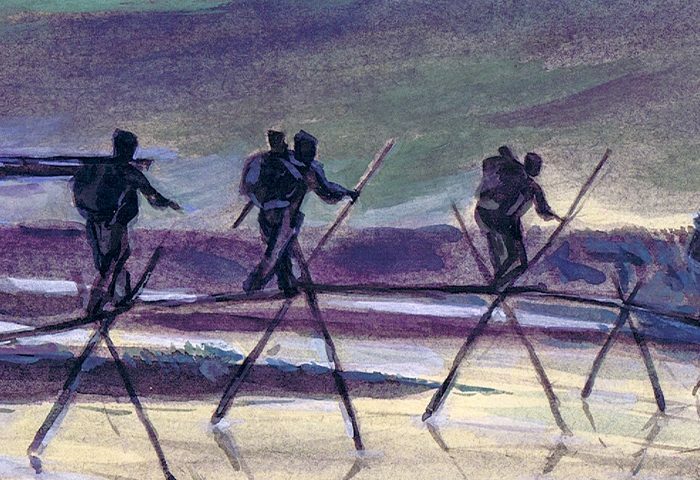 In 1976, his painting December Evening on the Red River (Tối tháng 12 trên sông Hồng) was given to the Cuban government as a gift by the Vietnamese government. 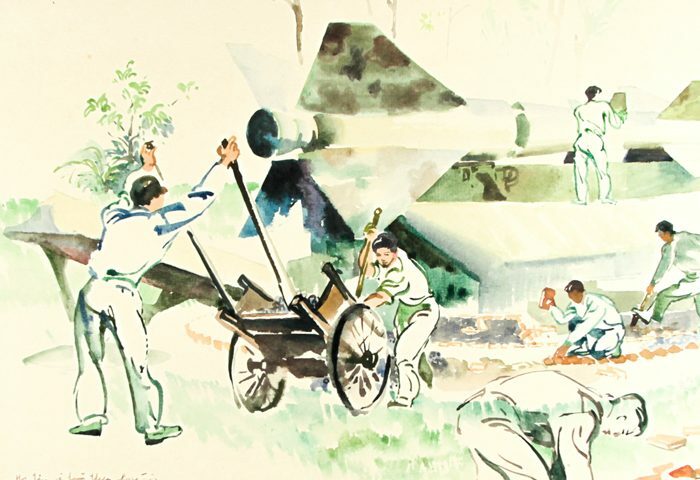 After April 1975 and the liberation of Vietnam, Thọ remained in the same role with the Hanoi Air Defence Division 361, joining the Vietnam Fine Arts Association in 1980. In 1984, however, he moved to Ho Chi Minh City. In part, his decision to move was based on the warmer weather – better for his ageing parents. He was also interested in the revitalised art scene experimenting with a wide range of artistic disciplines in Ho Chi Minh City, something that gelled with his wish to concentrate on his artistic career. 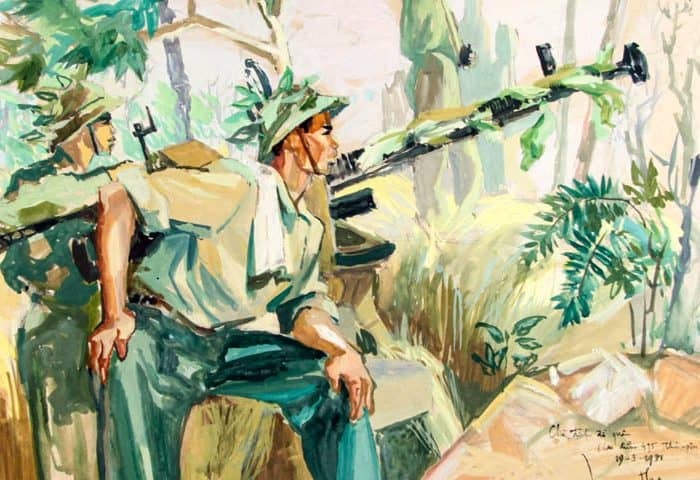 Although still employed by the army, in 1984 he was put in charge of building and organising the new museum dedicated to 367 Anti-aircraft Division, the division established and made famous by their vital role in the victory at Điện Biên Phủ. As an artist in this role, he was in charge of designing and presenting exhibitions within the museum. He was given permission to retire when the museum was complete. Thọ retired from the army as a Major in 1990. From 2000 until 2010, he worked for the checking board of the Central Fine Arts Association. From 2005 until 2015, he was a member of the checking board of the Ho Chi Minh Fine Arts Association. His roles during this time were to assess whether organisations were following rules and acting as a mediator between organisations that may have had certain disputes. Thọ has never held a solo exhibition. Nguyễn Ðức Thọ lives in Ho Chi Minh City. Nguyễn Ðức Thọ, 1970, Seng Phan, Khan Muon front in Laos, "Đồng chí Nguyễn Văn Bế Trung đội trưởng bộ đội pháo cao xạ Quảng Trị chiến đấu trên 1,300 trận ở Tiểu đoàn 7; Vùng T.L (Comrade Nguyễn Văn Bế, platoon leader of Quảng Trị anti-aircraft gun unit has fought over 1,300 battles in the 7th Battalion)." Watercolour on machine made paper. Nguyễn Ðức Thọ, 29 January 1975, Hải Phòng. "Học tập và làm theo phong trào Hứa Văn Luận; (D84 Đoàn Hạ Long) (Study and Follow the Action of Hua Van Luan; (Unit D84 Ha Long))." Watercolour on machine-made paper. Nguyễn Ðức Thọ, 23 April 1972, Quảng Trị Province, "Nhà Mới Quảng Trị (New House Quang Tri)." Watercolour with gouache on machine-made paper. Nguyễn Ðức Thọ, 19 March 1971, High point 495 at Xé-pôn (also known as Tchepone or Sepon) in Laos, "Chờ địch đổ quân (Cao điểm 495 Thác Pôn) (Awaiting enemy troops (High Point 495 Thác Pôn))." Gouache on machine-made paper. Nguyễn Ðức Thọ, 13 February 1972, Trường Sơn mountains in western Quảng Trị Province. Watercolour on machine-made paper. Nguyễn Ðức Thọ, 23 January 1975, Hạ Long. "Luyện tập đánh SR-71 D84 Đoàn Hạ Long (SR-71 Training Exercises Unit D84 Ha Long)." Watercolour on machine-made paper. Nguyễn Ðức Thọ, 28 January 1975, Hải Phòng, "Ra Đa T1-12 (D84); Phân Đội Tăng Gia Giỏi (Radar T1-12 (D84); A Good Production Unit)." Watercolour on machine-made paper. Interview conducted with Nguyễn Ðức Thọ by Witness Collection on 30th July 2018 at his home in Ho Chi Minh City.